Recently won the "Best Experimental Short" category at the Hollywood Short Film Festival. 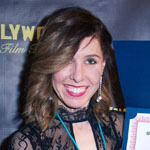 Held annually in Santa Monica, CA, the Hollywood Short Film Festival brings together students from the most prestigious film programs around the country. Mallory's film, Esoteric, was created as a final project for French 330 "History of French Cinema" and explores how one woman sends herself into despair by looking in and only thinking about herself. Mallory previously held an internship with Elliott Hall of Music Productions, where she created a video for the Journal of Purdue Undergraduate Research Magazine. She was the assistant director for the short film Continuance, a semifinalist in the 2015 Student Academy Awards, and second place winner at the Raw Science Film Festival.